4J Studios' Halloween-themed texture pack will finally give Minecraft-loving psychopaths the tools they've always wanted. Just one week after releasing the "Minecraft Natural Texture Pack," the folks at 4J Studios are at it again. But this time Minecraft is getting the Halloween treatment. Starting today, Xbox 360 owners can download a free, Halloween-themed texture pack that should turn Minecraft into one of those not-so-scary Halloween hayrides. Unfortunately, if you purchased the game on any platform besides the Xbox, you will be unable to attend this particular Halloween party. "It's the scariest night of the year," reads the game's description, "but that's not to say we can't have a lot of fun! 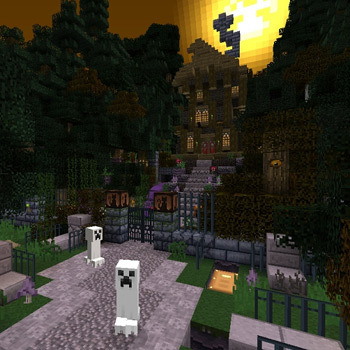 Get this celebration texture pack to give your Minecraft worlds a spooky look. Happy Halloween!" The pack will give players access to a decidedly darker set of textures-complete with ghost creepers and jack-o'-lanterns. It's not the kind of thing that'll genuinely scare anyone, but it does have a charming, Nightmare Before Christmas kind of creepiness. The package will only be available until November the 3rd, so you may want to grab it before you eat a pillowcase full of candy and forget.